The Splendid Fairywren, also known as a Blue Wren of a Splended Wren, is a passerine bird belonging to the Maluridae family. It is one of 12 species in the genus Malurus which is found in Australia and New Guinea. Malurus splendens splendens – known as the Banded or Splended Fairywren, this subspecies is found in southern and central Western Australia. It was the bird species named in 1830 by Quoy and Gaimard. Malurus splendens musgravei – first scientifically described by Gregory Matthews in 1922. It is found in malle and mulga country in South Australia and the southern part of the Northern Territory. 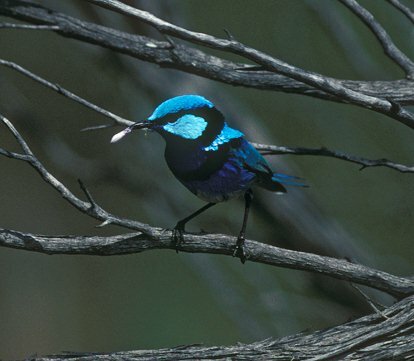 It is also known as the Turquoise Fairywren because it has turquoise or lighter blue upperparts and a black rump. Malurus splendens emmottorum – it became a subspecies in 1999 due to Schodde and Mason’s work. It is found in south-western Queensland. 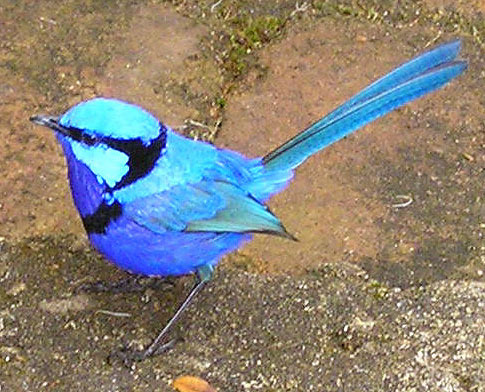 The nominate species of the Splended Fairywren is a small bird with a long tail. It is about 14 cm long. It has a high degree of sexual dimorphism as breeding males have a bright blue forehead and ear coverts, a violet coloured throat, and a deep rich blue back wings, tail, and chest. It has a black bill, chest band, and eye band as well. Non-breeding males are brown with blue wings and a bluish tail. Females look similar to non-breeding males but they have a chestnue coloured bill and eye patch. I wanted to do this for my biology presentation but emily wouldn’t let me.